Are you seeking for ONGC Recruitment 2019? If yes, There is news for you. 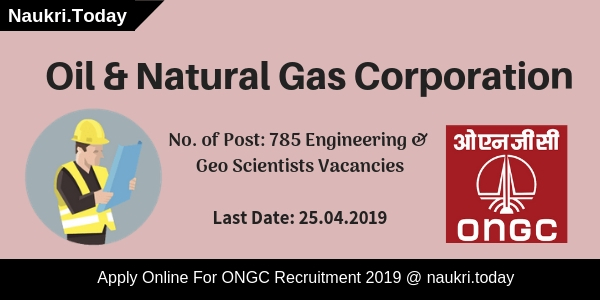 Oil and Natural Gas Corporation has published notification for 785 Engineering and Geo Scientists Vacancies. The Department is going to appoint candidates for ONGC Jobs 2019 on the basis of GATE 2019 score. The Online Registration will be started from 05 April 2019. Interested and Eligible applicants may fill up their application form before 25 April 2019. Graduate and Post Graduate Engineering participants may fill up their application form through online mode from links given here. For Furthermore information aspirants should read below article carefully. Fresh Update as on 10.04.2019: Candidates can apply online for ONGC Recruitment 2019 at here through the direct link as given below. You can also check the eligibility criteria etc from the given below. What Are The Important Dates To Remember For ONGC Jobs 2019? Some FAQs Regarding ONGC Jobs 2019? Questions Arise At The Time of Filling UP ONCG Online Form? What Is The Physical Standard Required for ONGC Bharti 2019? Engineer Degree in relevant subject with minimum 60%. Post Graduation in any discipline with minimum 60%. Selection Process For ONGC Jobs 2019 on the basis of GATE 2019 score & Interview. How To apply For ONGC Engineering Jobs 2019? Log on To the Official Website of Oil and Natural Gas Corporation i.e. ongcindia.com. After that search for ONGC Vacancy Advt. section at the homepage. Read complete notification carefully and check the eligibility criteria. Eligible candidates may apply online from here. Pay Application fee through a suitable method. Click on Submit for registration. Conclusion: Oil and Natural Gas Corporation has released notification for 785 Engineering & Geo Scientists Vacancies. Participants may fill up their online application form for ONGC Recruitment 2019 from a link given here. Dear Applicants, Are you waiting for ONGC Recruitment 2019? If yes then here is a good opportunity for you. Oil and Natural Gas Corporation has issued new notification for 4014 Apprentice Posts. Participants who are interested & eligible can apply through online mode. Online registrations for ONGC Apprentice Vacancy 2019 is going to take place on 14.03.2019. Applicants must submit their application form till 28.03.2019. Selection of the candidates will be done on the basis of marks obtained in the last qualification. For more details, candidates must read the given below article carefully. ITI Certificate in respective discipline. Bachelor’s degree from any recognized university. Selection Process For ONGC Jobs 2019 Marks obtained in stated qualification. Pay Band For ONGC Recruitment 2019 Salary will be given as per rules & regulations of Apprentice Act 1961. Which Documents Candidate Need To Carry For Document Verification Of ONGC India Jobs 2019? 10th Class Mark Sheet or Any other Birth Certificate issued by the education board. Semester Wise or Year Wise Mark Sheets. Is There Any Application Fee To Apply For ONGC India Recruitment 2019? No, all category candidates are exempted from payment of application fee for ONGC Vacancy 2019. To get more details, applicants can read the ONGC Notification 2019 from the link given here. Conclusion: Oil and Natural Gas Corporation has issued notification for ONGC Recruitment in which 4014 seats are available for Apprentice Post. Participants can apply online for ONGC India Vacancy till 28.03.2019. For more details read above information. Candidates can download ONGC Jobs Notification from here. Are you waiting for ONGC Recruitment 2019? If yes, there is good news for you. Oil and Natural Gas Corporation, Tamil Nadu is going to recruit applicants on 86 Class III & IV Vacancies. Participants who have a diploma in relevant filed can apply through online mode. Interested candidates may fill up their application form for ONGC Vacancy 2019 before 20 February 2019. Online Registration Process is going to begun form 31 January 2019. The Department may exempt SC/ST/PWD/Ex-Service Man from the payment of an application. Only General and OBC Category aspirants will pay Rs 370/- as an application fee & Rs. 299.20 plus Bank Charges for the registration fee for Class III & IV Vacancies. Candidates should check here qualification, age, Physical Standard, and Application fee for ONGC Bharti 2019 before applying. Participants must enter all the details in an application form carefully, otherwise, their form will be disqualified. 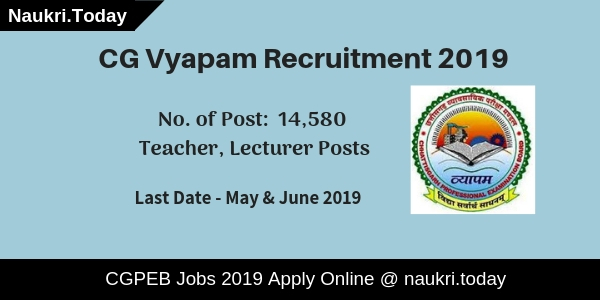 Candidates who are eligible for Class III & IV Vacancies may apply online form here. The Registration will be started from 31 January 2019. Here we gave you links for filling up an application form for Oil and Natural Gas Corporation Vacancy 2019. A-2 ₹12,000-27,000 per month 3 years Diploma in Relevant Engineering (Instrumentation, Mechanical, Electronic, Telecom., Civil , etc). A-1 ₹11,000-24,000 per month Matric with Science & Trade Certificate in surveying/ Graduation Degree with typing Skills/ Intermediate with 6 Months experience in Fire Service. W-1 ₹10,000-18,000 per month Matric with Fireman’s training of three months duration. Valid Driving License of Heavy Vehicles. The Department has set minimum and maximum age difference for all categories for ONGC Recruitment. Here we gave you a table which consists of Details regarding age Limit for Class III & IV Posts. The Department has provided age relaxation as per department rule for Oil and Natural Corporation Jobs 2019. Candidates who are physically fit only those applicants can apply for ONGC Class III & IV Recruitment 2019. The Department has mentioned Physical Criteria in the official ONGC Notification. Applicants must check here Physical Standard before applying. Female For Females For All categories 152 cms Proportionate to height but not less than 46 kgs. For Tribes/Hill men 147 cms. Log on to the official Website of oil and Natural Gas corporation Department i.e ongcindia.com. After that click on Career Option given at the Homepage. Now search for ONCG Class III & IV Recruitment PDF. Read Complete Notification carefully & check Eligibility criteria. After that Eligible aspirants may apply online form here. Now Submit your application fee through a suitable mode. Conclusion: Oil and Natural Gas Corporation Department has issued notification for 86 Class III & IV Vacancies. Candidates may collect here details eligibility criteria details regarding ONGC Recruitment 2019. For further more information aspirants may refer to the above article. Dear Applicants, Do you want to apply for ONGC Recruitment 2019? If yes, then here is a great opportunity for you. Oil & Natural Gas Corporation has released notification for 309 Non-Executive Posts. Participants who are interested can fill online application forms for ONGC Non-Executive Jobs 2019. Online registrations are going to take place on 7th January 2019. The last date to fill online application form is 27.01.2019. 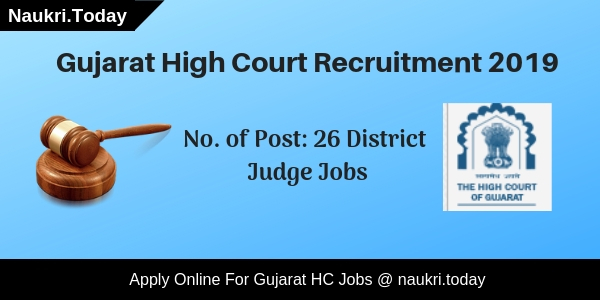 For more details regarding the selection process, eligibility criteria & pay scale, Candidate should read the given article carefully. Participants who are going to fill application form for ONGC Recruitment 2019 must check eligibility criteria. Here some eligibility parameters are fix by the department which are given below. Applicants who wish to apply online for ONGC Assam Vacancy 2019 must check required qualification here. Candidate must have done 3 years Diploma Course in relevant field for Assistant Technician post. Similarly, Aspirants who are applying for Junior Assistant Technician post must have passed 10th class from any recognized board. To get rest of the details regarding education qualification, participants must check ONGC Non-Executive Jobs 2019 notification from here. Candidates must check age limit before filling application form for ONGC Recruitment 2019. Applicants who are applying for A I & A 2 Level Jobs must have age between 18 to 30 years. Participants who are going to apply for W 1 Level posts should have age between 18 to 27 years. Here upper age relaxation scheme is also applicable for ONGC Assam Recruitment 2019. For more details contenders may see ONGC Notification 2019 from the link given below. Department will conduct Computer Based Test for the candidates who have filled online application forms for ONGC Recruitment 2019. Online test will be going to take place in the month of March 2019 tentatively. Applicants who qualify in CBT will be called for PET/ PST & Skill Test. Selection of the aspirants will be on the basis of marks obtained in each stage. It is compulsory for the aspirants to get qualify in each stage. Some physical standards & physical efficiency parameters are fixed by the department. Participants must fulfill those parameters to get selected for ONGC Non-Executive Vacancy 2019. For more details, participants can check ONGC Notification 2019 from the link given below. Department will provide salary according to the post for ONGC Recruitment 2019. Participants can check their salary details in below section. If candidate has any doubt regarding pay scale you can check ONGC Assistant Technician Vacancy 2019 notification here. Participants who are going to apply for ONGC Recruitment 2019 need to application fee also. Candidate who belongs to General/ OBC & Unreserved Category needs to pay Rs.370/- as registration fee. All other Reserved category/ SC/ ST/Ex-Servicemenn applicants are exempted from payment of examination fee. To get rest of details about application fee aspirants should check ONGC Notification 2019 from the link given at the end of the article. Applicants who want to fill the application form for ONGC Non-Executive Recruitment 2019 must apply online before the last date. Here we are providing you with some easy steps to follow while filling online registration form for ONGC Assam Vacancy 2019. Firstly, candidate should log in to the official website i.e. ongcindia.in. Then search for ONGC Jobs notification link. Click on notification link & read it carefully. Eligible participants must click on the “Apply Online” link. Fill all details in ONGC Recruitment Form. Upload your recent passport size photo & signature to form. Recheck all the details filled by you in the registration form. Make payment of application fee through online mode. Applicants can also take print out of application form. Conclusion: Oil & Natural Gas Corporation is inviting application for 309 Non-Executive posts. Applicants who want to apply can fill the application form for ONGC Recruitment 2019. Participants should fill online forms before the last date i.e. 27.01.2019. ONGC Exam will be going to be held in the month of March 2019 Tentatively.